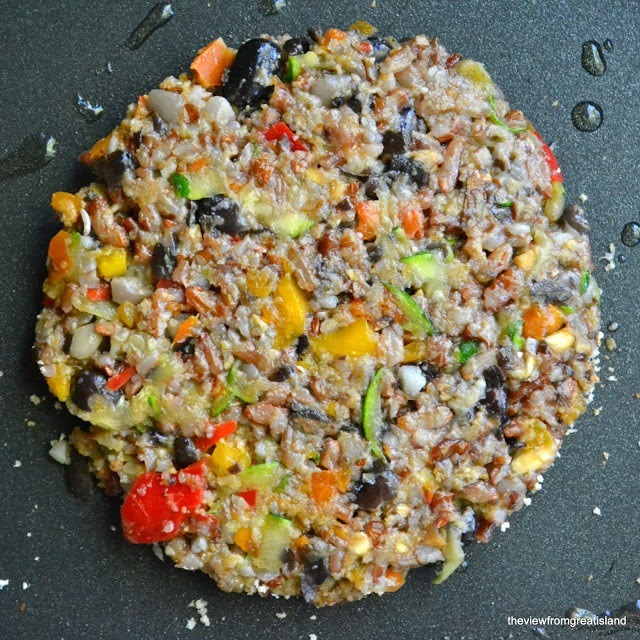 The Ultimate Veggie Burger ~ the burger is the all American summer favorite, and switching out a healthy meatless burger just makes so much sense. To be honest, half the fun is the bun and all the toppings, anyway! You can make a big batch of these vegan burgers and freeze them for easy healthy eating all year long. Put the rice in the bowl of a food processor fitted with the metal blade. Pulse the machine until the rice has broken down but still has some texture. Don't process into a paste, but break down the rice so there are no big pieces. Remove the rice to a bowl, and then put the black beans in and do the same thing. Measure out 1/2 cup of the processed beans and add to the bowl. Add the shredded zucchini, bread crumbs, beaten egg, Worcestershire sauce and spices. Add lots of fresh cracked black pepper, and mix everything together until completely combined. At this point your mixture should resemble a meatloaf or meatball mixture: moist and sticky but not too wet. If it seems overly wet, add a bit more bread crumbs. Using an ice cream scoop or spoon, take a fourth of the mixture and form it into a ball. Place on a square of waxed paper and cover with another square. Press down to flatten slightly and then flatten with a tortilla press or a plate, using gentle even pressure to press the burger into a round. Use your fingers to even it out. Stack the burgers on a plate, in their waxed paper, and refrigerate for at least an hour to allow them to firm up. Grease your pan with olive oil and cook the burgers for about 4 or 5 minutes on each side, until they are hot through and crisp on the outside. Be careful when flipping them because they are delicate. Homemade veggie burgers probably won't work on a grill because of their delicate texture, but you could try if you have a special pan. Add a slice of cheese at the end of the cooking time, if using. Serve right away in a bun with all your favorite fixin's!